These S’mores Pudding Cookies were one of the first cookie recipes that we ever posted on The Best Blog Recipes! Now 2 1/2 years later I can honestly say that they are still my favorite cookie recipe on our blog! They are so moist and highly addictive. If you haven’t tried them yet then run, don’t walk to your kitchen and grab what you need because they are that good! These S'mores Pudding Cookies are the softest and most delicious cookies I've ever tried. Consider yourself warned... because you'll want to eat the whole batch yourself! Roll into small balls (I used about 1 tablespoon of cookie mix per cookie) and place onto parchment lined cookie sheet about 2 inches apart. Press down on cookie ball to flatten to about 1/2 it's balled height. DID YOU TRY THIS RECIPE: WE’D LOVE TO HEAR HOW YOU LIKED IT IN THE COMMENTS BELOW. WE SEARCH SOCIAL MEDIA A FEW TIMES A MONTH FOR THE HASHTAG #THEBESTBLOGRECIPES SO MAKE SURE TO SNAP A PIC AND USE THE HASHTAG WHEN LOADING IT ONTO YOUR INSTAGRAM, FB, G+, PINTEREST AND TWITTER AND WE’LL STOP BY AND SAY HI AND CHECK IT OUT! COPYRIGHT Q&A: WE LOVE THAT YOU LOVE OUR POSTS! WE ASK THAT IF YOU ARE A BLOGGER OR WEBSITE OWNER AND WANT TO TRY THIS RECIPE THAT YOU MAKE THE RECIPE, TAKE YOUR OWN PHOTOGRAPHS AND WRITE THE BLOG POST AND BAKING INSTRUCTIONS IN YOUR OWN WORDS. YOU MAY USE OUR PICTURE WITH A DIRECT LINK BACK TO THIS BLOG POST AS LONG AS THE INGREDIENTS AND INSTRUCTIONS ARE NOT INCLUDED WITHIN YOUR BLOG POST (RECIPE ROUND UPS ARE THE PERFECT EXAMPLE). SO IT’S YOUR CHOICE… OUR PICTURE WITH A LINK BACK TO THIS BLOG POST FOR THE INGREDIENTS AND INSTRUCTIONS OR YOUR PICTURE AND YOUR OWN WRITTEN INSTRUCTIONS. THANKS! Can you tell me how many cookies this makes? It really depends how big you make them. But about 2 dozen medium sized cookies! And mine! You linked it to mine! 🙂 Ha. These look unbelievably yum. Such a good idea, too! These look so great! I love anything s’mores, but a lot of the recipes I find are either complicated or messy. But these look totally doable! Thanks for sharing! These look so good! We love smores and we love cookies so it’s sure to be a hit in our family! You’ve been featured this week in the Weekend Kitchen Link Party — be sure to come back this week to link up another recipe! I just pinned – these are so yummy looking! These look delicious! Can’t wait to try them out this weekend! Popping in from It’s A Crafty World link party. Thanks for taking the time to stop by and comment Kim 🙂 Hope you have a great rest of your week! Thanks Danielle! Glad I could share them at your party this week! Oh wow, looks amazing! Must try! Thanks so much for linking up to Heavenly Treats Sunday Link Party! You are being featured this week, tomorrow make sure to come over and get your featured button! Love your blog, I am following you now! Thanks so much Pamela for the feature! I’ve added your button to my “Where I’ve Been Featured” page and I went and linked up again this week too! Pinned & looking forward to trying! 🙂 Thanks for sharing! What a yummy cookie! Thank you for linking it up to A Crafty Soiree, I’ve featured your recipe in the newest one. Please come by to see your feature and share more of your tasty ideas with us. Awesome, I always like trying new cookie recipes. I have yet to make a pudding cookie. What the heck am I waiting for, these look amazing!!! Thanks for sharing these beauties at Saturday Share With Us! These sound very yummy. I love the idea of pudding and graham crackers! I will be trying this recipe! 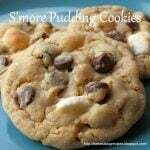 We just love Smores and will love these awesome cookies, they need to be in my Cookie Jar. Hope you have a great weekend and thanks for sharing your tasty recipe with Full Plate Thursday. Oh my goodness – those look delish! Thanks for stopping by Sarah and commenting!